If you like crafts and technology and the tactile and sensual experience of reading printed books, then you would really appreciate creating printed art pieces with a hand-operated letterpress. I got that chance at the print studio at the Jaffe Center for Book Arts (JCBA) at Florida Atlantic University (FAU) in Boca Raton, Florida. 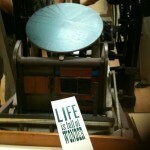 The open house was timed for Letterpress Appreciation Day, celebrated worldwide on September 18. In the muted environment of warm woods, terracotta walls graced with esoteric prints and art, and soft jazz playing in the background, young children and adults of all ages showed up for the demonstrations. Visitors came away with posters, bookmarks and prints for framing. Posters were made on a letterpress manufactured in 1890 by F. Wesel Mfg. Co., New York. A massive block of black metal configuration, rooted in the age when machines were meant to last forever, dominates the Studio. A coat of ink in each of two colors had to be hand-rolled on the plate with raised design of letters and shapes for each and every printing made by a visitor. Digital and old letterpress technology were blended for turning out a delicate print of an air balloon. The original print was scanned and digitized to make a prototype for a plate out of flexible, rubber-like polymer. 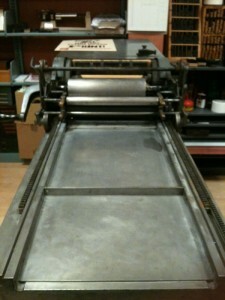 You depress a pedal on the bottom of the 1940s Vandercook letterpress in order to lift a clamp that holds the heavy stock paper in place to avoid blurring and getting out of register. Then you rotated the hand crank clockwise. 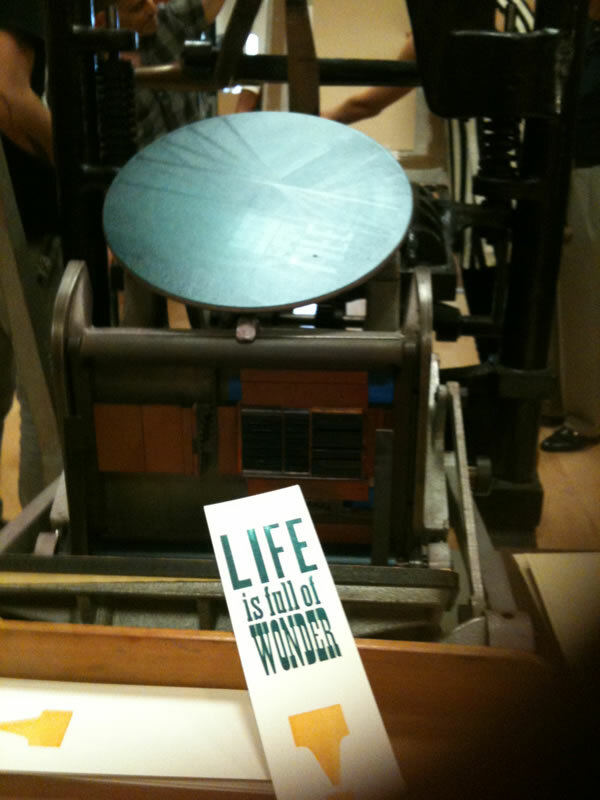 Visitors used a smaller press made in West Germany, sometimes called a clam shell press, to produce bookmarks. 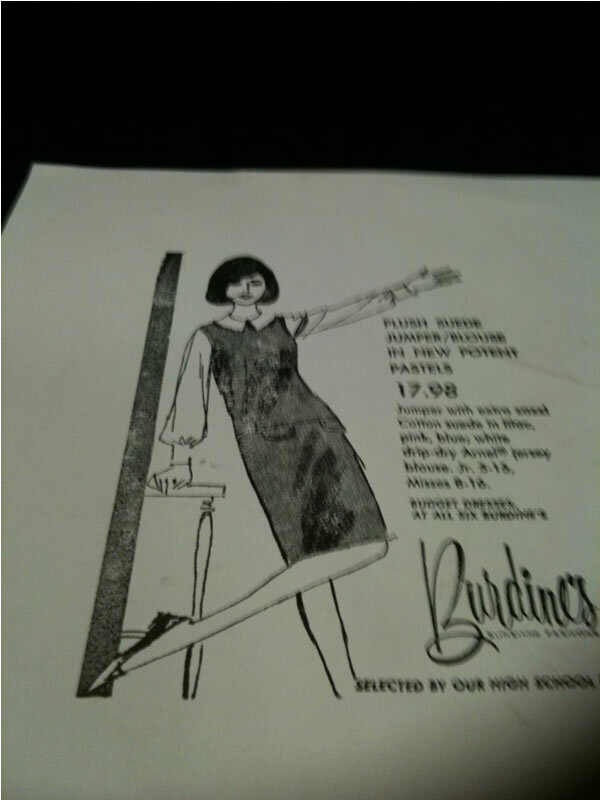 by Lee King of Miami, representing a sort of graphic design history from 1950s – 1970s, Miami. 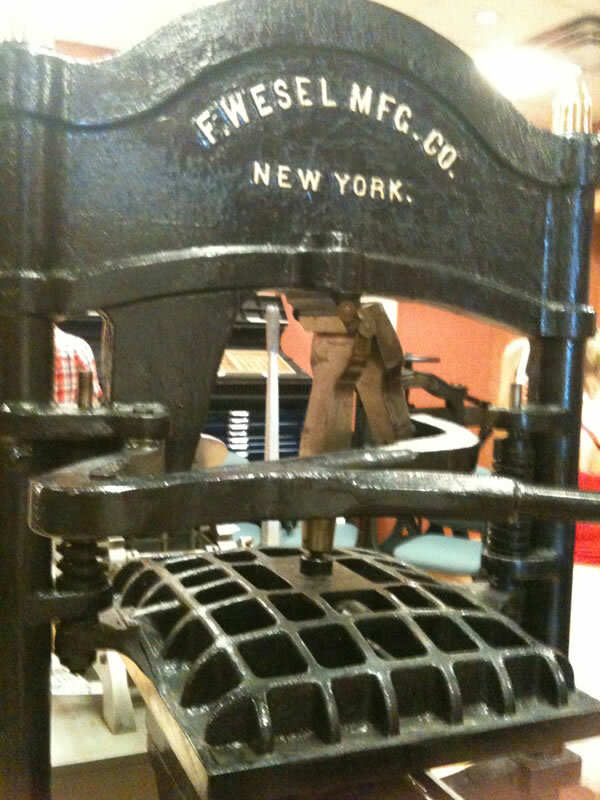 A Potter proof press from 1910 was also on permanent exhibit, as was a miniature letterpress perched on a small shelf that was used for printing business cards. 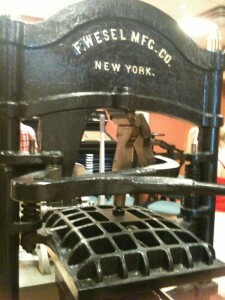 In all, the Center has five different relief presses, all of which, according to the JCBA website, are actively used by students and visiting artists to create hand-printed books and literary broadsides. The open house was sponsored by Convivio Bookworks, a book arts studio based in Downtown Lake Worth. Handmade limited edition books and broadsides were for sale, including Book + Art: Handcrafting Artists’ Books by Dorothy Simpson Krause. 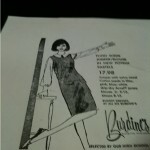 A portion of each sale benefited the Jaffe Center for Book Arts.